An insightful new book on the challenges of international development and how the church can gain a more effective voice in working for solutions. "Let not the needy, O Lord, be forgotten; nor the hope of the poor be taken away." This prayer from the Book of Common Prayer expresses our hope as a people of faith committed to seeking justice and peace. 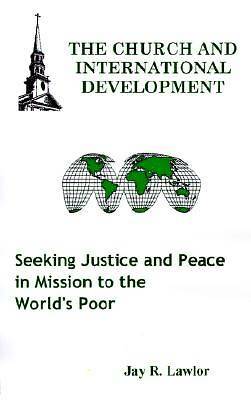 The Church and International Development: Seeking Justice and Peace in Mission to the World's Poor is the first straightforward primer on the role of the church in dealing with the problems of international development. In this book, Jay Lawlor presents easy-to-understand explanations of the issues pertaining to sustainable development. He discusses such important topics as global poverty, the international debt burden, human development, the environment, and the roles of the World Bank and International Monetary Fund (IMF). Lawlor provides startling evidence on the profound levels of poverty and inequality in the world. Over 50% of the world's population live in poverty, with 1.5 billion living on less than $1 per day. Of the world's nearly 6 billion people, 4.4 billion live in developing countries. Of the developing world population, 60% lack access to basic sanitation, 33% lack safe drinking water, 25% lack adequate housing, and 20% lack modern health services. The chasm between the 'have' and 'have not' grows wider and there is no starker contrast than the fact that the world's three richest people own assets that exceed the combined Gross Domestic Product (GDP) of the world's poorest 48 countries.